Let's travel the world! 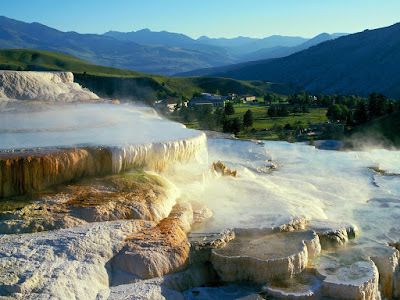 : Geysers & Hot Springs of Yellowstone National Park! 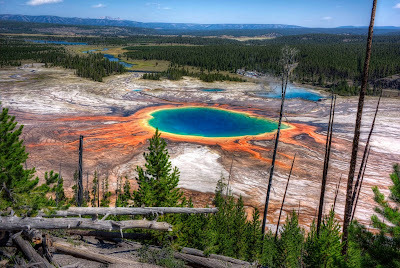 Grand Prismatic Spring and Midway Geyser Basin, Yellowstone National Park. Yellowstone National Park is a national park located primarily in the U.S. state of Wyoming, although it also extends into Montana and Idaho. 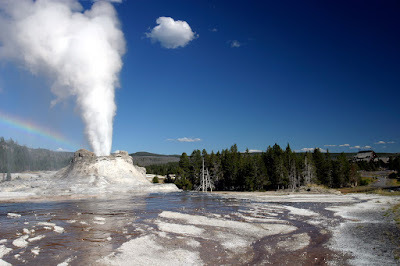 Yellowstone, widely held to be the first national park in the world, is known for its wildlife and its many geothermal features, especially Old Faithful Geyser, one of the most popular features in the park. It has many types of ecosystems, but the subalpine forest is most abundant. 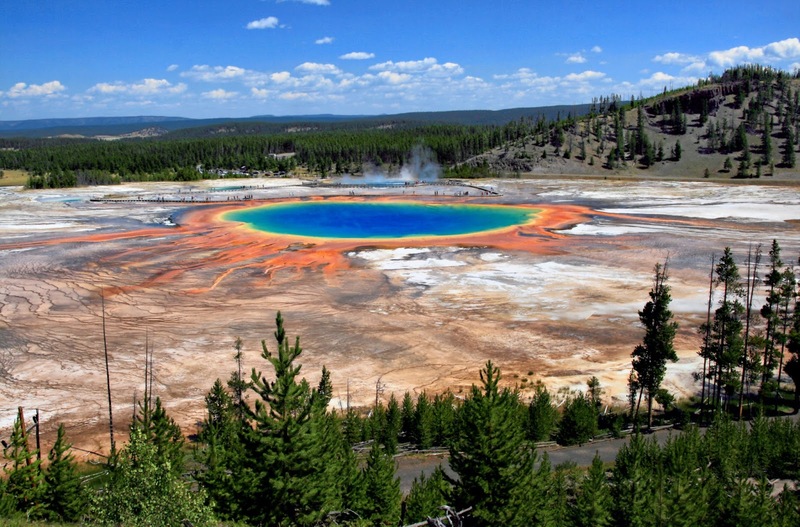 Yellowstone is the largest active geyser field in the world. Home to about half of the world’s geysers. 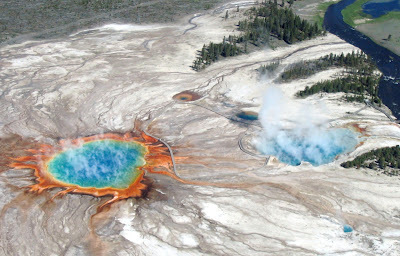 Yellowstone is home to over 10,000 hot springs and geysers. Some geysers erupt 300 times yearly. Many erupt faithfully, while others we don’t recommend you wait around for... 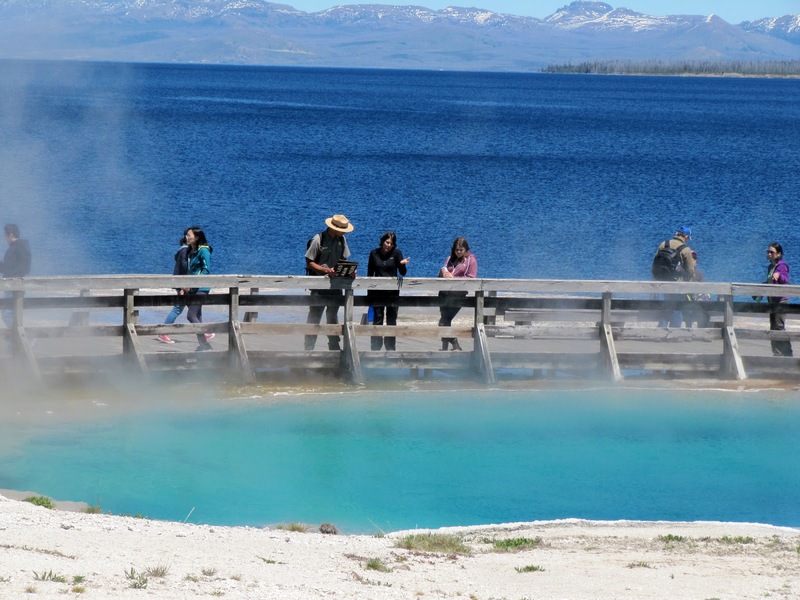 There are several major geyser basins that visitors can explore by way of boardwalk or paved trails. The most famous geyser in the park, and perhaps the world, is Old Faithful Geyser, located in Upper Geyser Basin. Castle Geyser, Lion Geyser and Beehive Geyser are in the same basin. Old Faithful Geyser erupts approximately every 91 minutes. 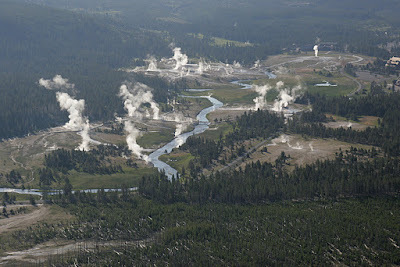 Aerial view of Upper Geyser Basin. 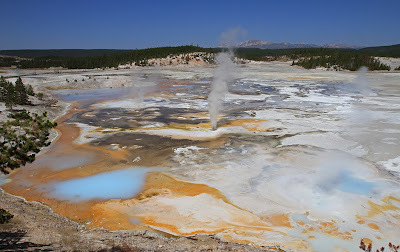 The Upper Geyser Basin, Yellowstone’s largest geyser basin and in fact, the world’s largest single concentration of hot springs, occupies about one square mile. 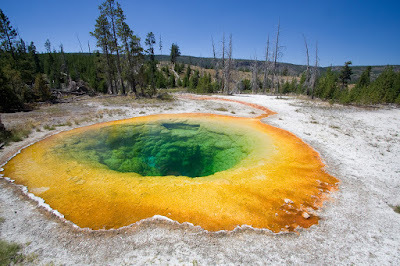 Located between the Old Faithful area and the Biscuit Basin road, the Upper Geyser Basin contains several groups of hot springs, including over 150 geysers. The basin is less than a half-mile wide and most of its geothermal features are situated within a few hundred feet of the Firehole River. It is recommended that those planning a visit to the Upper Geyser Basin spend a good portion of their time here. 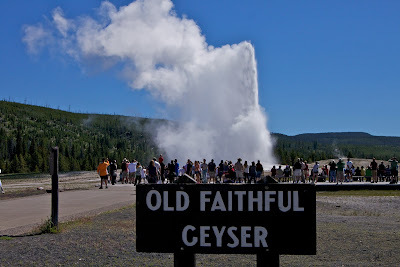 Old Faithful is the most famous geyser in America. It was discovered in 1870 by the Washburn Expedition. Old Faithful geyser has erupted more than a million times since Yellowstone became the world’s first national park in 1872. On average, Old Faithful erupts about every 92 minutes, and shoots water 135 feet into the air, but has been known to shoot it as high as 190 feet, and as low as 100 feet. Eruptions can last anywhere from one-and-one half minutes up to five minutes. 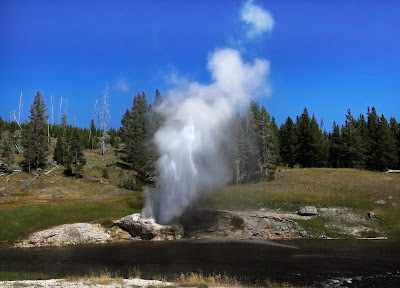 Castle Geyser is most interesting because it accumulates so much energy. After about 15 minutes, Castle goes into a raucous steam phase that roars like a train. Castle erupts from one of the largest cones in the Upper Geyser Basin. Its cone is 30 feet tall, and intervals between eruptions average about 11-13 hours. Expect water to shoot 70-80 feet into the air. Riverside Geyser is worth seeing because it’s so unique. It erupts over a river. Riverside shoots water about 80 feet into the air at 60-degree angle across the Firehole River. 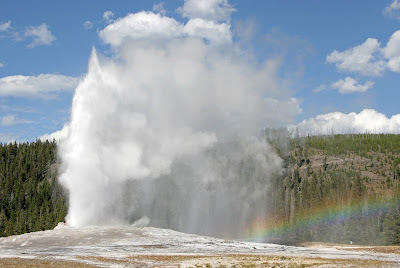 Check this geyser out in the afternoon and you may even see a rainbow in the eruption. This geyser erupts about every six hours, each lasting about 20 minutes. 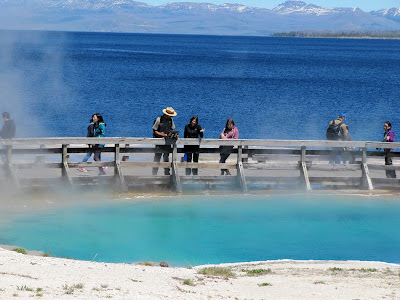 At the end of a path by the Old Faithful Inn, you’ll see the Morning Glory Pool. It used to be more multicolored and vibrant. But, as people threw coins and trash in it over time it plugged up. The result was a drop in the pool temperature, and the death of the bacteria mats surrounding the pool. An aerial photo over Yellowstone's Midway Geyser Basin. 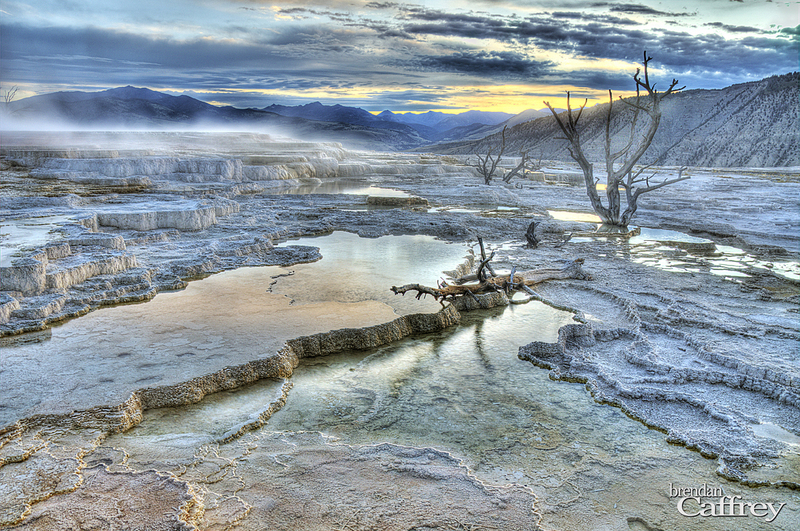 This basin is located “midway” between Yellowstone’s Upper and Lower geyser basins. Although Midway Geyser Basin is small, it is home to some of the largest single hot springs in the world. Grand Prismatic Spring is Yellowstone’s largest single hot spring and the world’s third largest hot spring. This was the park’s earliest described feature in 1839, when it was written about by fur trapper Osborne Russell. The enormous pool is not only huge, it’s colorful. Notice the steam that is suspended in the air directly above the large spring. The steam reflects the colors of the rainbow. 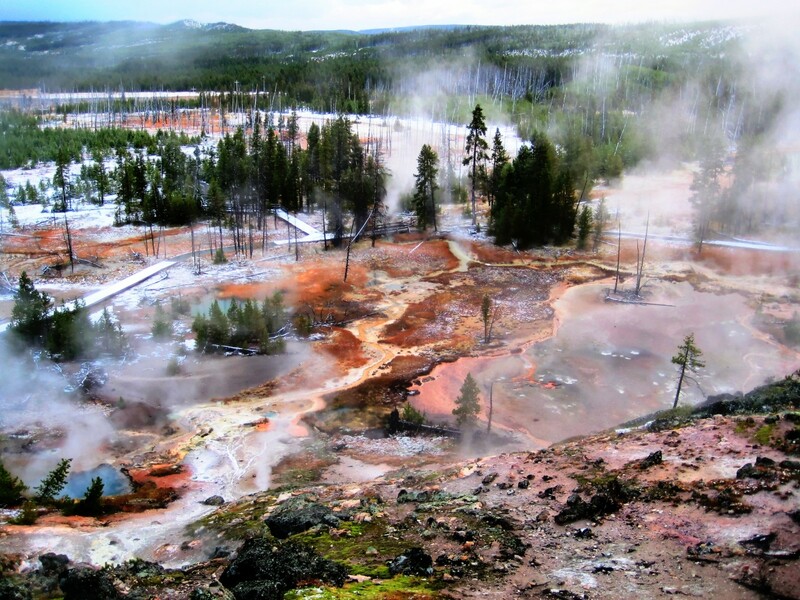 Lower Geyser Basin is home to approximately 100 geothermal features. Combined, these features cover five square miles and include all four types of features, including fumaroles, hot springs, geysers and mud pots. Lower Geyser Basin is located between Madison Junction and the Old Faithful area. Lower Geyser Basin is home to approximately 100 geothermal features. 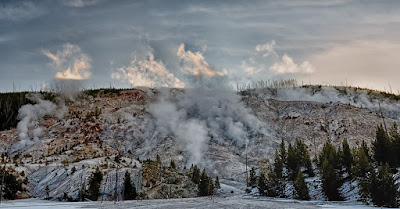 Acidity in the steam is responsible for the surface rock in this area breaking into clay. The clay and the steam pushing through it create natural occurrences and the most popular attraction in the basin, the Fountain Paint Pots. The steam responsible for the paint pots is enough to cultivate the clay and mull its shades of white, brown and gray, but it can’t muster the strength or the amount of water necessary to wash the clay away. Additional liquid at different times of the year gives the paint pots their characteristic look of bubbling, blended mud. 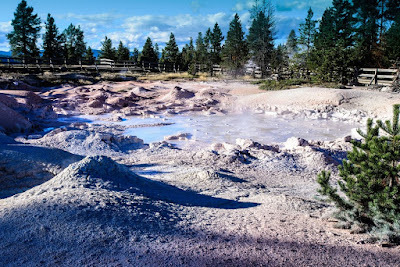 Fountain Paint Pots is Yellowstone’s most easily accessed large group of mud pots. 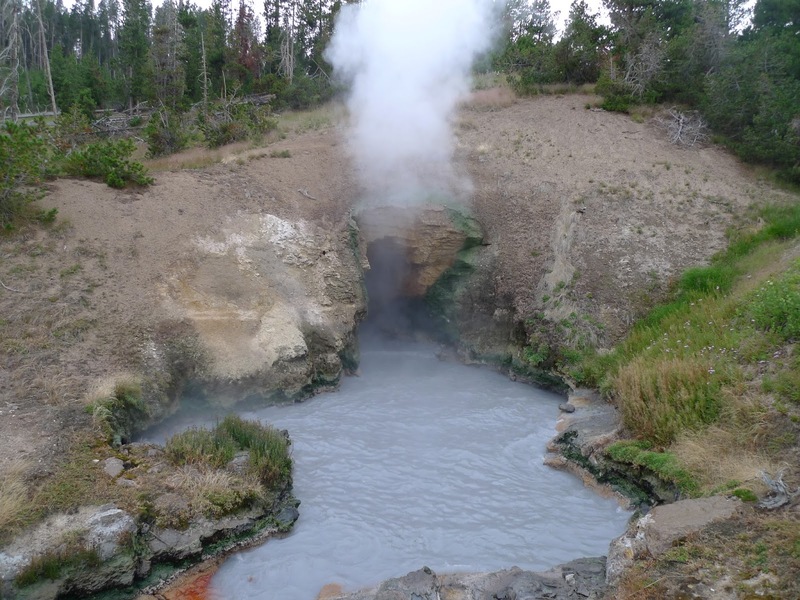 North of Norris, Roaring Mountain is a large, acidic hydrothermal area (solfatara) with many fumaroles. In the late 19th and early 20th centuries, the number, size, and power of the fumaroles were much greater than today. The fumaroles are most easily seen in the cooler, low-light conditions of morning and evening. Artists’ Paintpots is a small hydrothermal area south of Norris Junction that includes colorful hot springs and two large mudpots. West Thumb Geyser Basin of Lake Yellowstone. 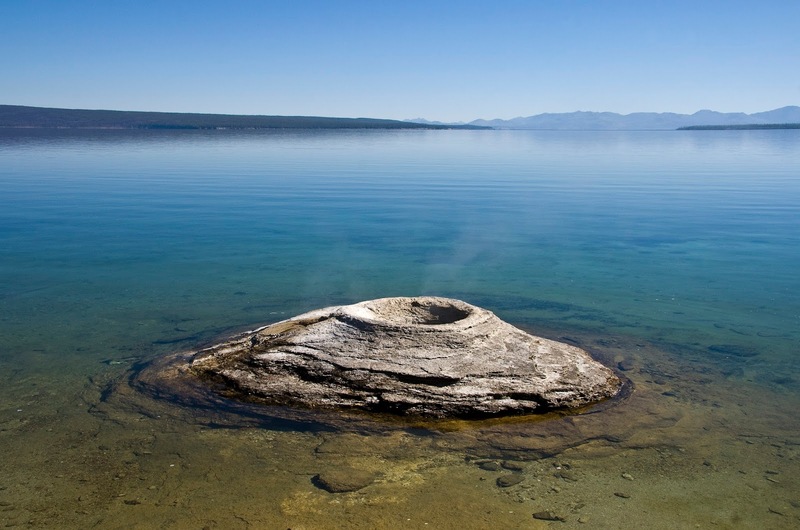 The West Thumb Geyser Basin is the largest geyser basin on the shores of Yellowstone Lake. The heat source of the thermal features in this location is thought to be relatively close to the surface, only 10,000 feet down. It is interesting to note that West Thumb is a caldera within a caldera. The most famous hydrothermal feature at West Thumb is a geyser on the lake shore known as Fishing Cone. Walter Trumbull of the 1870 Washburn-Langford-Doane Expedition described a unique event while a man was fishing adjacent to the cone: “…in swinging a trout ashore, it accidentally got off the hook and fell into the spring. For a moment it darted about with wonderful rapidity, as if seeking an outlet. Then it came to the top, dead, and literally boiled.” Fishing Cone erupted frequently to the height of 40 feet in 1919 and to lesser heights in 1939. One fisherman was badly burned in Fishing Cone in 1921. Fishing at the geyser is now prohibited. Yellowstone’s hottest geyser basin is Norris Geyser Basin. A research drill hole at the basin found a temperature of 459 degrees F (237 degrees C) at a depth of only 1,087 feet. Many geyser-gazing experts feel Norris Geyser Basin is the most exciting and unpredictable of the various basins in Yellowstone. Two very different basins make up Norris Geyser Basin: Porcelain Basin and Back Basin. 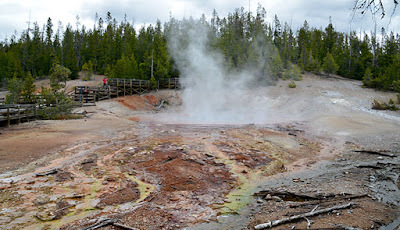 Back Basin has impressive geysers like Echinus Geyser, while Porcelain Basin is home to many hot springs, vents and pools. Cistern Springs in Norris Back Basin. Echinus Geyser in Norris Back Basin. It’s worth waiting around to see Echinus Geyser erupt. Echinus Geyser is the most popular of all the geysers at Norris but recently has become very unpredictable. Echinus gets its name from the Greek word for “spiny.” The same root word gave the sea urchins and starfish their collective name of “echinoderms.” An early visitor to the park thought some of the stones around the crater resembled sea urchins. Echinus usually erupts every 2 hours-4 days – not necessarily one you want to wait around for… Watch as its large crater slowly fills with water. Echinus is a typical fountain-type geyser, throwing its water in a series of closely-spaced bursts. Echinus is always active and will provide one of the best eruptions you will see in the park. Mud Volcano, Yellowstone National Park. 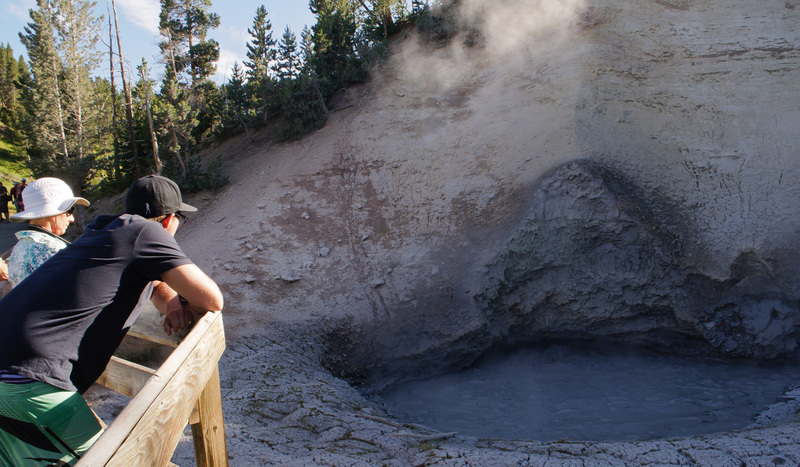 When exploring Yellowstone National Park, visitors should not overlook a visit to Mud Volcano. Located just north of Yellowstone Lake, the Mud Volcano area includes over a dozen unique geothermal features. Many volcanoes once erupted here long before Yellowstone became a national park. Over 600,000 years ago, one eruption was so powerful that it blew lava across the continent. Following the eruption, the land collapsed, leaving a large depression in the earth. Over time this “caldera” filled with lava, resulting in the large volcanic plateau that comprises most of central Yellowstone. The Mud Volcano region is close to the center of the caldera. In fact, the lava from the explosive eruption flowed through a vent that lies in this collection of mudpots. Visitors traveling through certain parts of Yellowstone will no doubt smell a “rotten egg” odor. 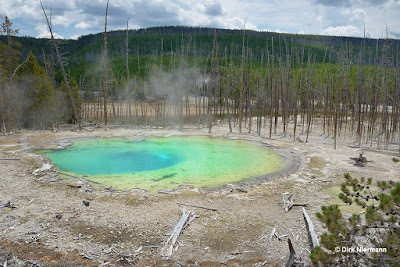 Bacteria here actually eat the sulfur and create sulfuric acid. As it evaporates, it becomes hydrogen sulfide gas. That’s what you smell. The Mud Volcano region is more acidic than some of the park’s other geyser areas. This is due to the sulfur present in Mud Volcano’s soils. Sulfur and bacteria basically eat up surrounding rock, creating mud. Dragon’s Mouth Spring is this area’s most popular feature. This is a spring that fills a cave in the side of a hill. The gases that rise to the surface cause the water to splash back and forth against the three cave walls. This splashing of water resembles a tongue lashing out. “It’s the rhythmic belching of water that gave this spring its name. The spring is inside the cave and it’s so steamy that you can’t really see all the way back, in but we think it’s pretty shallow,” says Karen Reinhart, a park ranger naturalist. If you listen closely, you’ll hear rumblings from deep below the feature. This is evidence of the area’s stored energy and heat. 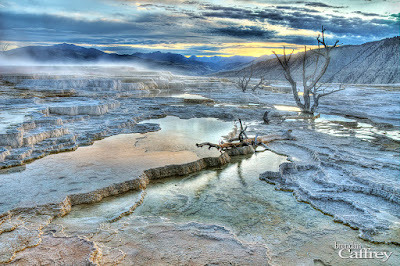 A unique kind of spring exists at Mammoth Hot Springs, located in the northwest section of the park. Hot water ascends through ancient limestone deposits. The result is a landscape of terraces sculpted by travertine limestone. At Mammoth Hot Springs, Yellowstone visitors will enjoy views of travertine limestone terraces. Flowing waters spill over the colorfully streaked Minerva Terraces, resulting in a gentle waterfall appearance. Hot gases are stored underneath the surface. Water seeps down into the ground and meets with these gases. Some of the gases are readily dissolved in the hot water to form an acid solution. This hot and acidic solution dissolves great quantities of limestone as it works up through the rock to the surface. Once exposed to the air, some of the carbon dioxide escapes from the solution. As this happens, limestone no longer remains in solution and it is deposited, resulting in the terraces. Mammoth Hot Springs deposits about two tons of travertine limestone (calcium carbonate) per day. For more info visit Yellowstone National Park website.